Custom windbreaker jackets are some of the most famous promotional items in the market today. Windbreakers are worn best during wintertime. They come in a range of styles and colors that's why people love to procure them. If you provide your customer with a well-made Custom windbreaker jacket, you have a good chance of promoting your company to a mass audience. You will surely capture people's attention. Windbreaker jackets are a type of clothing designed for the upper half of the body. Windbreaker jackets have early forms of layers, but it is the shorter type. Today people rarely wear formal coats, but windbreaker jackets are still very much in fashion. Windbreakers are a kind of thin jackets that are worn to guard the body against chills and mild rain. Producing Custom windbreaker jackets allows you to promote your company and still creates an opportunity for your customers to wear something casual and fashionable that they may use anytime they want. You may even award it as a gift to clients and guests. Corporate jackets is an incentive to hard-working employees. Here are other benefits of using custom windbreaker jackets. 1. Sure Visibility - jackets are items which could be donned by people. Unlike pens or notebooks usually kept inside the bag or briefcase, jackets have a higher chance of being seen by the public because people wear it. 2. Expansive Coverage -These items may be put on by people of all ages. It can be put on by men and women. Hence, you can be sure of its contact with a broad reach of audience. 3. Extensive Shelf Life - Customized logo jackets are designed to last for a long time. You don't have to get anxious about it being spoiled or ruined right away. 4. Convenience and Ease of Use - Unlike coats which may be dull to wear and maintain customized jackets are easy to sustain. It is easier to wash, and people won't have a difficult time keeping it in excellent condition. 1. Check the Stitch - It is always wise to scrutinize the stitching of the coats you are buying. Windbreaker jackets won't be able to serve their function if they get frayed on the seams at once. Better make sure they are entirely stitched up. 2. Check the Fabric -You have to know that the fabric or material of your jacket is people-friendly. Would you not want your customers or clients to feel uncomfortable now right? Take time to choose the structure that caters to their needs. 3. Think of Style -Nowadays people are very fashion-conscious. Go for a style that's one-of-a-kind and trendy at the same time. The goal here is for your customers or clients to want to put on your customized jackets every day and not keep them in their closets. 4. 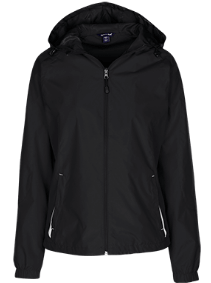 Additional Features -Some jackets available in the market today have extra features like side pockets that are zippered or hoods folded inside the upper portion of the garment. You might want to verify these out and see if it works for your company's aims. If you make your logo printed jackets different than rest, then you'll certainly stand out. In conclusion, if you want to give your customer a good time for them to see how important they are to your business, customize your windbreaker jackets. Customizing your windbreaker jackets is a great deal and gift for your customers.